Our Easter half term didn't kick off with the best of starts sadly! Spud was poorly during the week before the break up Friday and has most of the week off school. I called the doctors in a worry thinking it may of been scarlet fever as its doing its rounds and he had quite a few of the symptoms, fortunately it wasn't, but Spud was still poorly for some time! The schools broke up on Thursday for the Easter half term holiday, meaning Good Friday was just a day after. My dad had arranged for everyone to go to his for our annual Easter get together, and I wasn't sure we was going to be able to make it, but after persuasion from the family that they didn't mind Spud being around them we went along. 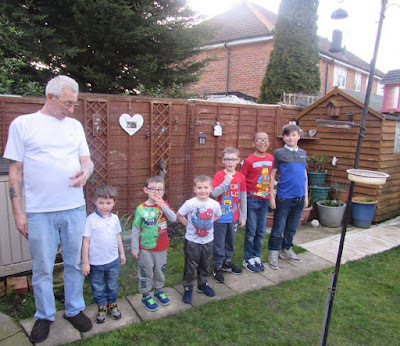 Spud had an extremely high temperature, was off food and even drink, so spent most of the time sat down, although he did have periods where he would play with his cousins and he did join in the egg hunt. Even getting to my dad's proved to be a bit difficult as where Spud had been sofa/bed bound for quite a while, his legs were achy from resting, it was the first time I'd ever seen Spud so poorly, even after his five operations he was up and about quite quickly, so it was quite worrying. Eggs and treats from the Egg hunt at Grandad's house, my siblings also brought Spud an egg each. On the Saturday I had one of my best friend's wedding to attend, Spud was at mine with Gareth when his dad called to take him out birthday shopping, I asked Spud on the phone if he wanted to go and he said yes, so his dad collected him for a few hours. I then received a phone call just 20 minutes after my friend and her husband tied the knot saying Spud was crying for me, so I spoke to my friend and got a lift home to be with my poorly boy. Birthday meal and birthday cake! The number 10! We had a birthday dinner booked for Spud with the family on the Saturday evening, I asked Spud if we should cancel and rearrange after the days events, but he wanted to go, so after a restaurant change we had a lovely three course meal at the restaurant where Gareth proposed to me! We took along a birthday cake too - Spud picked it himself, a rainbow drop birthday cake from Asda. 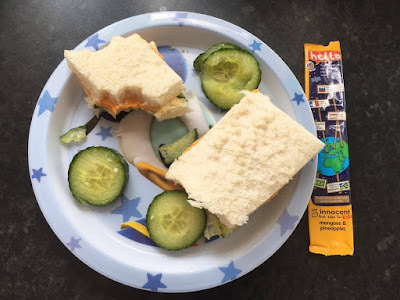 I then looked after my friends two children for the night whilst she could enjoy her reception. 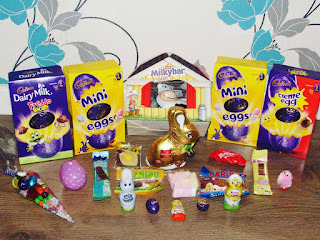 The Easter Bunny had left this for when we arrived home - with thanks to Gareth's help at pretending he left his house keys at mine to go back and put it all out for me! 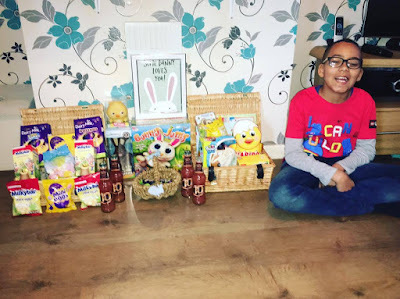 On Sunday we was at Gareth's house for an Easter egg hunt with his family, we was also offered a lamb roast dinner but due to Spud still being poorly, we come back home and had our own leg of lamb roast dinner, which sadly Spud didn't eat much of due to him still being off his food! 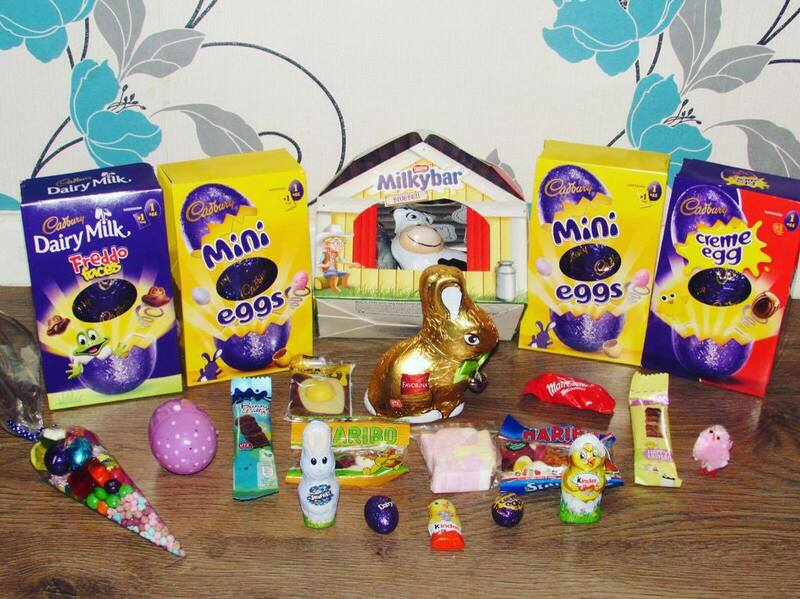 Plus I needed to get back home as the Easter bunny was yet to visit! 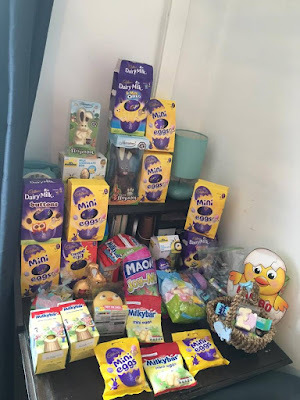 All of Spud's Easter eggs, treats and chocolate from the family, Gareth's family and myself! 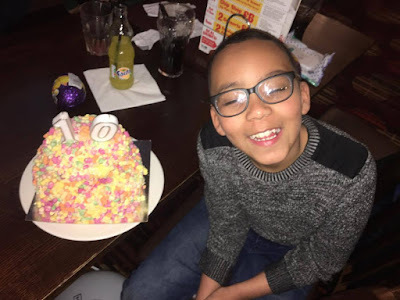 He also got £10 for Easter from Gareth's parents and my mum. On Monday we spent the day resting after a hectic weekend! Although I did order lots of birthday presents off Amazon with next day delivery for the birthday boys birthday! On Tuesday, Gareth looked after Spud for me whilst I went to town with my sister to get the birthday boy some present. It worked out quite well as they had lots of fun, and Spud perked up a little bit, it also meant I didn't miss any parcels as the house wasn't empty! 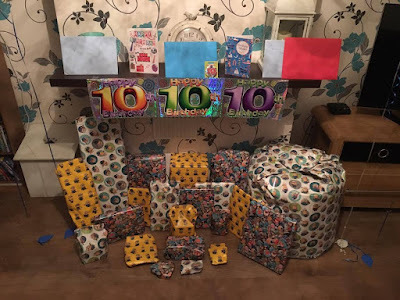 On Wednesday it was my boys 10th birthday, how!? He was so excited getting down the stairs, although it was at the slowest speed ever due to his legs still being achy! 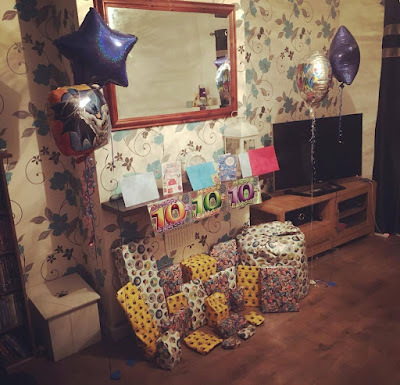 Spud loved all his presents, cards and money he received, he even commented on the wrapping paper and the balloons which was a bonus - trying to sneak that all into the house without him seeing the day before was nearly mission impossible! After breakfast, a wash and getting ready, my dad - Spud's grandad picked us up ready for a day out with the family. We had arranged to go bowling and went on the right day as they was having a free family day meaning the kids got their faces painted, and we had a complimentary photo! 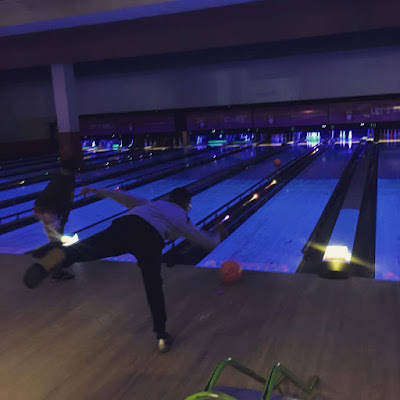 We played two rounds of bowling, Baby Boo won the first round, and Spud won the second round! I also sneakily picked up another birthday cake without Spud knowing, so we all sang happy birthday and the bowling alley gave Spud a birthday shoutout over the tannoy that had the whole bowling alley cheering for him! After the games were over, the children had a play in the arcade before we headed back to the car and drove to McDonald's for a birthday treat lunch! Spud received more cards and items and was having a really good time! When we got home, we had two surprise deliveries, Spud's first ever magazine win and a great delivery from Sky Kids that I will be blogging about soon! The day ended with the birthday boy picking Chinese for dinner - it's a tradition in our home that the birthday person always gets to pick dinner on their birthday! On Thursday we had a play date with my sister and her two children (my nephews) - Spud's auntie and two cousins. 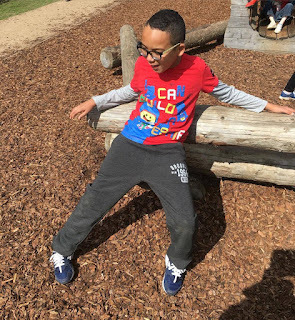 We drove to a park down in the country lanes which meant it was less busy than the parks around us, we was blessed with the sunshine too which was lovely! After the park we had a lunch date and it was nice to catch up with my sister, although she'd been with us yesterday and on the Saturday too! 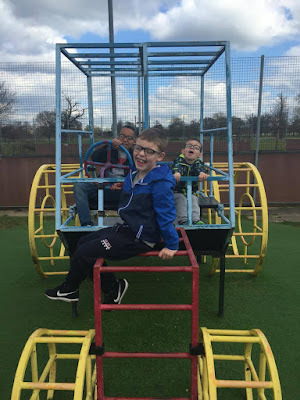 We spent the next few days mainly at home, but we had lots of fun and visited the local park a few times! We watched Disney movie after Disney movie and looked over photo's of Spud's first years of life! The second half of the half term week see Spud nearly back to himself completely, although he still wasn't eating as much and still had a slight temp! 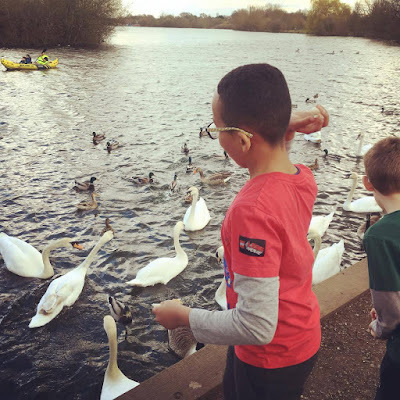 We went to the park on Tuesday with my sister and her two children again, this time we went to Dinton Pastures, somewhere I'd not been since I was a child, and somewhere Spud had never been! We wasn't even there for 20 minutes when Spud had hurt himself, so we left and went to feed the ducks by the lake. After a trip to get an ice cream, we took the children to Smyths to pick a toy each! On Wednesday we went to the cinema, and watched Disney's Zootropolis, again with my sister and her two boys, its really nice that we get to spend so much time together! The film was excellent, but what Disney film isn't!? We had popcorn, snacks and drinks, along with lots of laughter and fun! Then it was time for another lunch date before we headed home! Yesterday and today we've been in the house, apart from going food shopping yesterday afternoon. Today has been the only day Spud has really been able to play with all his new toys and games etc. We've had a briliant, fun filled and packed half term, but we're all looking forward to having a bit of normality back on Monday! Even the dogs knackered! Now I've got to decide what to do for the last remaining two days, all I have planned so far is a lovely lamb roast on Sunday! I hope you've all been enjoying the holidays!